The Palace Danbury announces God Help Us! 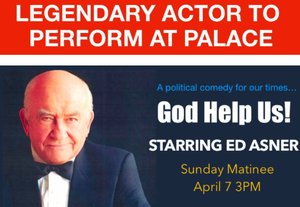 Starring legendary actor Ed Asner on Sunday, April 7 at 3 PM. SICK OF POLITICS? Red states versus Blue states… conservatives versus liberals… Pelosi versus Trump… It’s the perfect fodder for political comedy! God Help Us! stars legendary actor Ed Asner as a wise and wise-cracking deity. He confronts two political pundits-- who typify the talking heads from today's cable “news” channels-- in this thought-provoking & very funny play.